Kyodo arrived in Mount Tremper in the very early days, a year after the Monastery first opened as the Zen Arts Center. She soon moved in with her teenage son, Jori. 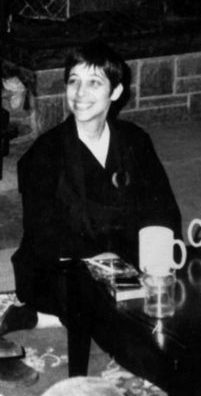 In 1986 she became the first monastic to ordain at the newly re-named Zen Mountain Monastery. She became shuso later that year, breaking new ground for those who would soon join her on the monastic path. Her dedication, talents and playful spirit were key elements in building the Monastery into a place for practice and community life. She was the first writer, editor and publisher of the Mountain Record, which began as a mimeographed newsletter. Her dharma name Kyodo, given to her by Daido Roshi, means “The Way of Respect”. 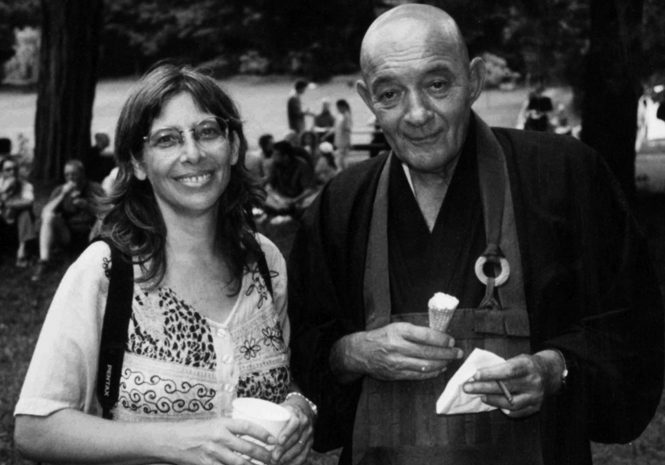 In 1989 Kyodo went on leave from the Monastery for cancer treatment, eventually moving to Florida to be near her family while regaining her health. She continued practice with Kapleau Roshi and eventually became a student of Daniel Doen Silberberg, Roshi who had also lived at the Monastery in the early years. Kyodo became a much-loved lay leader of the Broward Zen Group in Florida, part of Lost Coin Zen, Inc..
Kyodo passed peacefully in November after a long battle with pancreatic cancer. She is survived by her life partner Keeva, her son, mother and three sisters. In the early days at ZMM there were only about ten of us living at the Monastery, and we were all very close to each other and to Daidoshi. I think our struggles with the cold (there was no heating system back then), developing a training program, and supporting ourselves and the Monastery brought us even closer. It was a difficult time but Daidoshi’s teaching, and our developing practice, made it a very powerful, intense time too. Although he was with me in my heart, we were separated by 1,200 miles, but now that he doesn’t abide anywhere, there truly is no separation. Kyodo’s funeral and burial will be held with her family and the sangha at Zen Mountain Monastery in Spring 2019. She was a registered nurse for more than four decades, working in various hospitals and local schools, and was also a photojournalist and curator. Tensho is pre-deceased by her husband, Wallace F. Armstrong, and leaves behind eight children, step children and many grandchildren, as well as three siblings and their families, and her beagle, Barney. Visiting the Japanese temple in Bodhgaya. 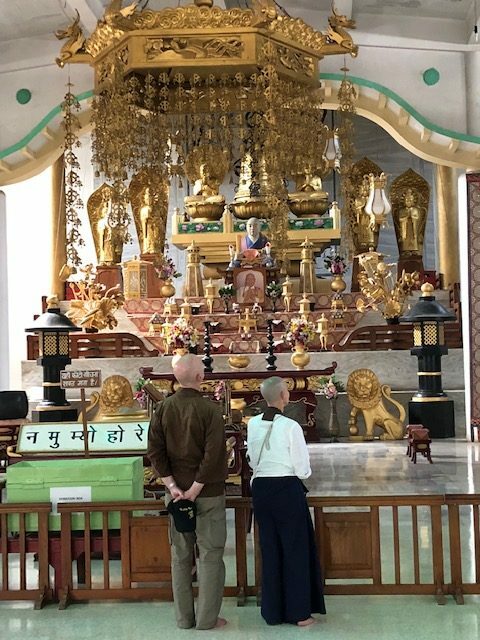 In October, Shugen Roshi and Hojin Sensei traveled to India with fourteen other sangha members for a three week pilgrimage in the Buddha’s footsteps. Photos and impressions of their trip written by the travelers are included in this issue under Sangha Reflections, and a more complete story can be found in Sangha News at mountainrecord.org. 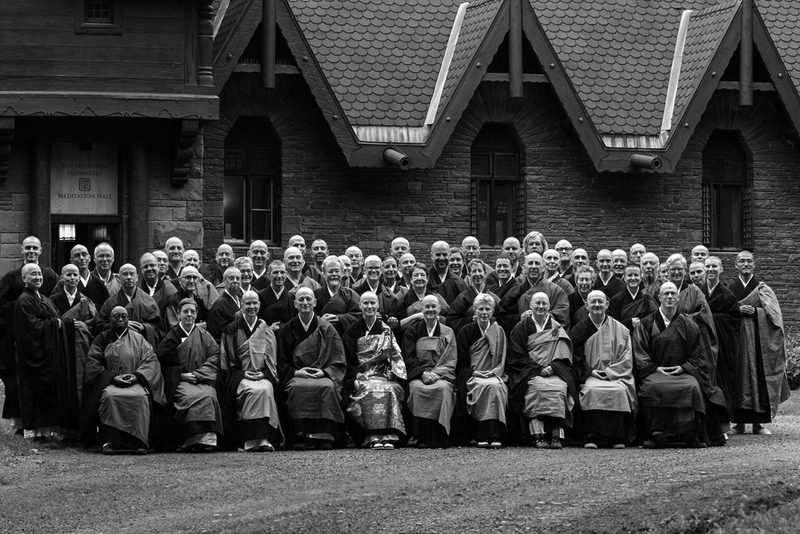 Earlier in the fall, senior monastic Shoan Ankele led a zazenkai with the sangha at the Zen Affiliate of Vermont, and in October senior monastic Gokan Bonebakker traveled to Buffalo to lead a zazenkai for the Buffalo Zen affiliate there. Hogen Sensei returned to Buffalo in February to lead a sesshin, accompanied by senior lay student Meiju Linet. On November 11, six students took the bodhisattva precepts with Shugen Roshi, signaling their development in the study of moral and ethical behavior as it is expressed through the Zen teachings. Each of these students has completed a course of study with Roshi looking at the historical understanding of the precepts and how contemporary practitioners can use these ancients teachings to help guide their decisions and activities. 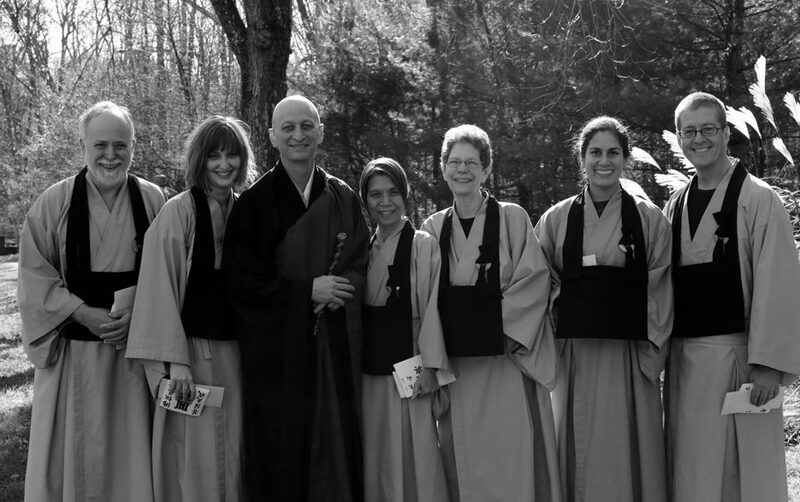 Left to right in the photo are Jonathan Seiko (“Boundless Peace”) Rosenthal, Polly Kiho (“Radiant Dharma”) Horn, Shugen Roshi, Achong Jusan (“Pearl Mountain”) Chen, Nancy Eisho (“Eternal Bloom”) Meyer-Emerich, Constanza Sokyo (“Everyday Sutra”) Ontaneda, and Steve Seigan (“Sacred Eye”) Miron. 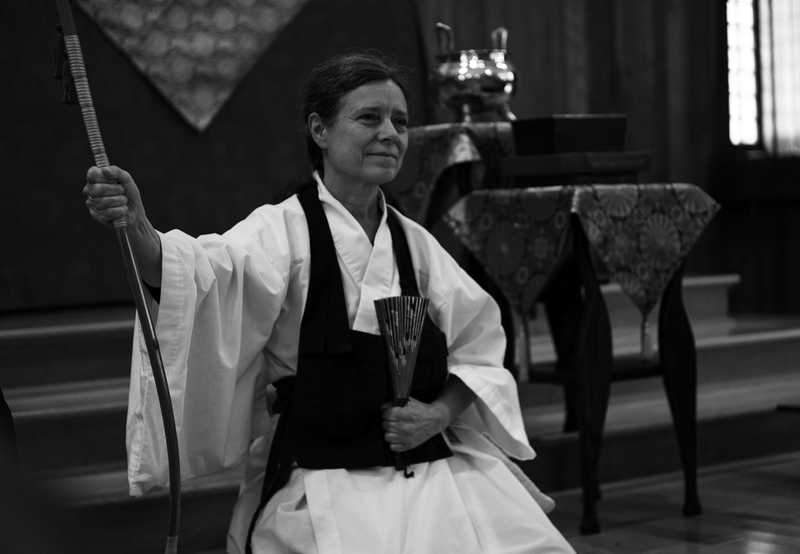 As our Fall 2018 Ango drew to a close, a new senior lay student Kerstin Seishin Maile completed her shuso training by delivering her first public talk and meeting the sangha in dharma encounter. A long time student at the Monastery, Seishin led the ango with dedication and her quiet, inspiring grace. In her talk she asked us to consider how our attention comes to bear on all our activities, and how to meet a divided world with the fruits of concentration practice. Listen to the full audio at zmm.org/media. This past Fall, Zen Mountain Monastery hosted the Soto Zen Buddhist Association biennial conference for three full days of practice, discussion and exploration. Over 70 ordained priests and transmitted teachers joined the conference, representing dozens of training centers and sitting groups throughout North America and beyond. SZBA was first established in the 1990s as a way to bring disparate ordained individuals together who are living with shared or overlapping cultural inheritance, and facing many of the same challenges within their sanghas. With close to 300 members, an engaged board of directors, and an active member listserv, the organization also functions as a platform for aligned Soto Zen priests to take a public stance on topical issues, many of which were discussed during the week. The conference was officially only open to SZBA members and associate members, which included ordained MRO monastics. Several talks and events were made open to non-ordained Monastery residents who were able to better familiarize themselves with how Zen priests in other orders make their way in the world, including those now living outside the cloister of a training center. Residents, in turn, worked enthusiastically all week to host our appreciative guests. All told, it was a rich experience for all, and you can read more and see photos at mountainrecord.org/sangha-news. On December 15th, Zen Mountain Monastery held it’s 30th Annual Dana Dinner, a holiday celebration open to anyone in our Catskill community, though particularly aimed at those who might not otherwise have a warm holiday meal. 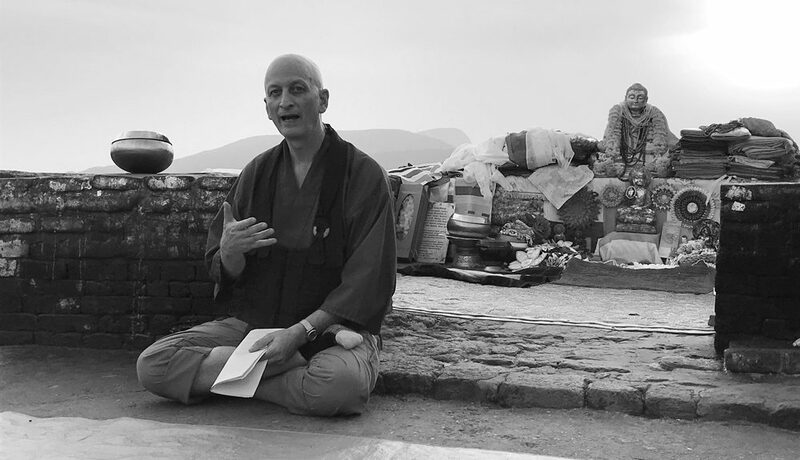 The event was founded by Daido Roshi in 1987 as a way for the Monastery to engage with the neighboring communities. It gives us all an opportunity to practice generosity and to benefit from the good company of local folks who otherwise wouldn’t visit the Monastery. Dana Dinner has always been made possible through contributions from local businesses and individuals, making this a true community event. 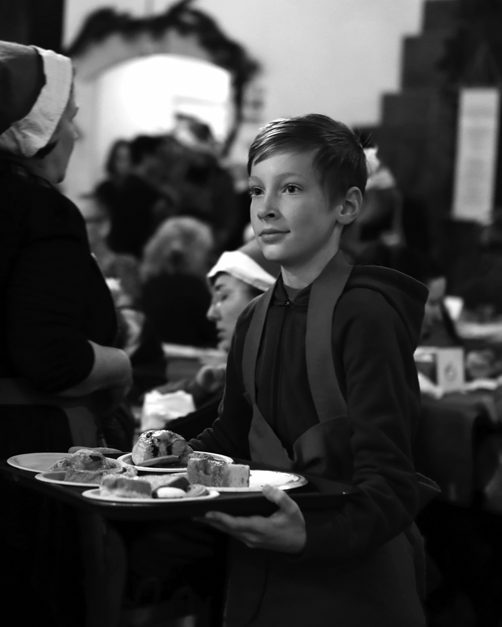 In recent years, the ranks of volunteers have swelled to include parents and kids of the sangha joining our other volunteers serving together as hosts and elves, bringing delicious plates from the kitchen and offering each guest their own special gift. 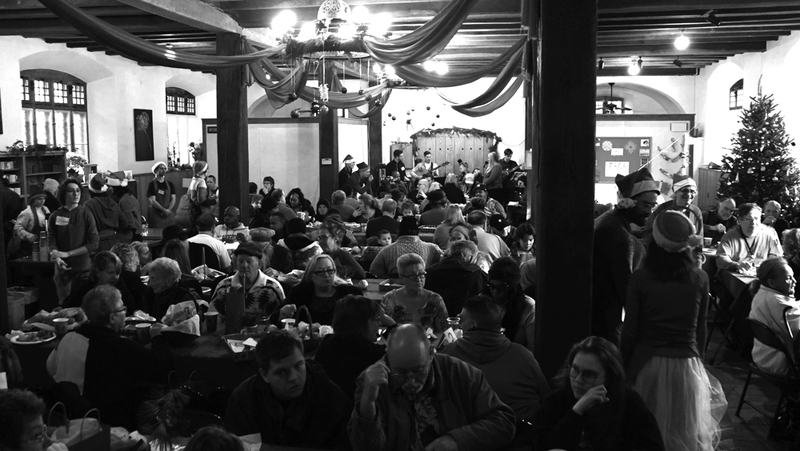 It is truly a highlight of our winter season and, with over 300 meals served, many commented that this was one of the most successful Dana Dinners of recent memory. Visit the Sangha News blog on our website to see more photos from this special day. And thanks again for everyone who contributed and helped out! This past fall Sam Pigott, Josh Dittmar, Michele Laura, Pat Carnahan, Anastasia Gochnour and Phil Duvall sat tangaryo and became formal students of the Mountains and Rivers Order. In February, Laura Cohen and Greg Witkowski also passed through the five gates of entry to become students. Congratulations to all! The Monastery would like to thank all of the bodhisattvas who continue offering their assistance at the Temple, the Monastery, and at all our affiliate groups. Gratitude to Shoju Greenwood for the donation of a new honey extractor, and to Kiho Horne for renovation planning at the Temple. Deep bows for stitchery and dye studio assistance from to the creative hands of many, to Seiyu Lanaghan for the curtain hangings at the Temple, and to Shoshin Chester for her on-going work making oryoki cloths. Monastery residents in October included Nyuko Schnadow of Mount Tremper, NY, Selim Anwar of Istanbul, Turkey, Elizabeth Boulter of London, England, Sophie Epstein of Brooklyn, NY, Krisha Heckman of Allentown, PA, Jack Hennessy of Bridgeport, CT, Samual Lord of Montreal, Quebec, Jessica Ludwig of Brooklyn, NY and Diane Vitells of Portland OR. Month-long residential training in October included Sean Byrne of Provincetown, MA, Anna Davydchuk of Paramus, NJ, Hoshu Norris of Madison, WI, Griffin Suess, Benjamin Weingsten of Ellicott City, MD, Constance Slanina, Corey McIntyre of San Luis Obispo, CA, Jason Long of Norwalk, CT, and Mary Pollard. The Monastery welcomed year-long resident in August Genjo Gebauer of Keene, NH, in September Joan Gutierrez of Chicago, IL, Eve Romm of Barrytown, NY, Riley Edson of Alpine, UT, and in December Julia Krupa of NY, NY. In January and February we said goodbye to Steven Siegelski, Liam Delaney, Renji Liss, Gregory Witkowski who completed a year of residential training, and also to Josh Dittmar and Doug Hull, who each lived at the Monastery for two years. In residency in September was Will Lee, and for two weeks Jacob Blair. In October we were joined by Ben Ehrlich for two weeks, Laura Cohen for one week, and Magdelena Ekstrom began a two month residency. In November Ali Harrington stayed for six weeks, and Mariyama Faye began a two-month residency. In December year-long residents Bingwan Liu and Stephanos Koullias completed their commitment, and we thank them for supporting the Temple sangha with their dedication and their practice. In January Anastasia Gochnour began the position of the Temple office manager and Jonas Dojun Leddington joined us for a month.